Recent travels, lesson preparation, and garden work have kept me away from the blogosphere for far too long. What fun is gardening if it’s not a shared experience? So I’m happy to be back, sharing my gardening exploits with you. The mid-Atlantic region is rich with public gardens, many of which sprout from land seemingly unfit for growing. Two recent trips, one to Wilmington, DE, and the other to New York City, revealed the beauty that can emerge from seemingly fallow land. 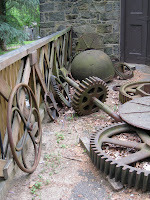 The Brandywine Valley, winding it’s way through Wilmington, DE and Kennet Square, PA, is best known for the Dupont Family Gardens: Longwood, Winterthur, Nemours, and the Hagley Museum/Eleutherian Mills. While all are beautiful testaments to the DuPont family’s commitment to shared spaces, it is the last, and perhaps least well-known, that we found most interesting. Eleutherian Mills was the first Dupont home in the United States. Originally a powder mill, it was not a pretty site, nor was it safe for the families who lived and worked the mills. The DuPonts were forward thinking, at least for their time.They provided homes, a school, and even a small pension for those injured in explosions. A final explosion in the 1920’s shut the place down, after more than 100 years of operation. The home and grounds were restored and inhabited by DuPont descendents until 1958. It was opened to the public in 1964. What is striking about Eleutherian Mills is the the beauty that arises in an area once leveled by its own destructive force. 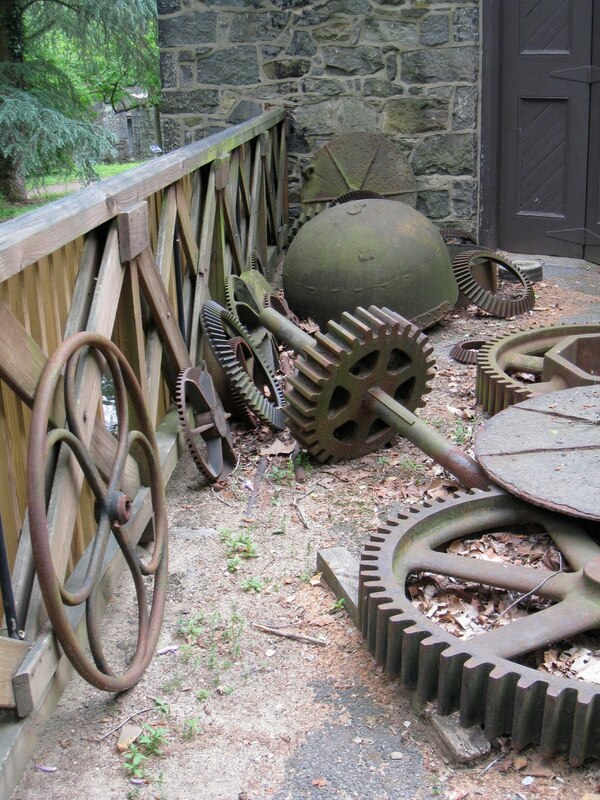 The mills are constructed of brick and are a sturdy example of workmanship we seldom encounter today. Overlooking the Brandywine River, they form a quaint, rambling path where Native plants and roses ramble. As with the other DuPont homes, the family’s commitment to historic preservation and publicly accessible gardens emerges in contrast to what we sometimes associate with the DuPont name: chemicals, manufacturing, and, gunpowder. It (sort of) sheds light on the baffling journal Garden and Gun . A visit to all four homes, as well as many other Brandywine Valley attractions, is well worth the short road-trip. Leaving Wilmington via Amtrak, we headed to another of our favorite destinations: New York City. Most people don’t go to New York to stroll through gardens. We don’t go for just that reason, but between eating and getting purposely lost, we find ourselves seeking the many delightfully surprising green spots in the Big Apple. Read the plaques on the tiny parks decorating intersections, and you’ll soon see the history of the city speaking through these oases of greenery. New York City’s green areas are reclaimed from long-fallow spots, inspired by a neighborhood vibe or public commitment to creating a shared space. 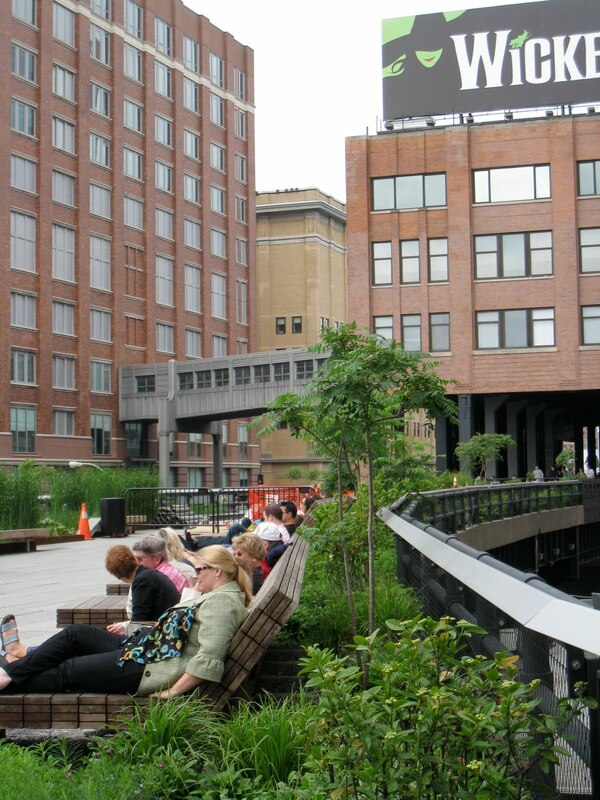 A recent addition to New York’s greenery is the High Line. Originally created in the 1930’s to lift freight traffic away from the busy streets below, the High Line functioned as a rail line until 1980. In 1999, a community-based non-profit group formed to prevent the demolition of the historic structure. After a drawn-out, sometimes contentious discussion centering on the value of a costly green space, the area was donated to the city by CSX transportation. Landscape architects designed a Native plant rooftop garden, which opened to the public in 2009. The High Line is now a public park featuring views of the Hudson River, the Meatpacking District and Chelsea. We enjoyed fresh Murry’s bagels and smoked fish from Chelsea Market, while reading the New York Times in this delightful space!